OpenFOAM includes a collection of functionObjects selected by the user at run-time to manipulate the simulation and provide mechanisms to extract field and derived quantities. Alternatively, the same actions can be executed after the simulation using the -postProcess command-line option. The sub-dictionary name <functionObjectName> is chosen by the user, and is typically used as the name of the output directory for any data written by the functionObject. 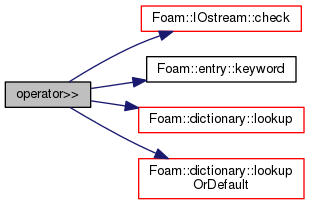 The type entry defines the type of function object properties that follow. FunctionObjects are packaged into separate libraries and the libs entry is used to specify which library should be loaded. The execute phase is meant to be used for updating calculations or for management tasks. The write phase is meant for writing the calculated data to disk. For each phase the respective time controls are provided, as listed above. Definition at line 70 of file fieldAverageItemIO.C. References IOstream::check(), fieldAverageItem::EXT_MEAN, fieldAverageItem::EXT_PRIME2MEAN, entry::keyword(), dictionary::lookup(), dictionary::lookupOrDefault(), and dictionary::null. Definition at line 107 of file fieldAverageItemIO.C. References token::BEGIN_BLOCK, IOstream::check(), token::END_BLOCK, token::END_STATEMENT, Foam::nl, and Ostream::writeKeyword().